To Cite: Ebrahimpour A, Karimi A, Shafaghi T, Zandi R, Sabbaghzadeh Irani A, et al. Pyoderma Gangrenosum Following External Fixation, Trauma Mon. 2017 ; 22(4):e34054. doi: 10.5812/traumamon.34054. Introduction: Pyoderma gangrenosum (PG) is a rare inflammatory skin disease, which is characterized by extensive ulcerative skin necrosis. The probable cause of PG is neutrophilic infiltration. In postoperative patients, the disease is often misdiagnosed as infection and the patient therefore undergoes improper treatment. 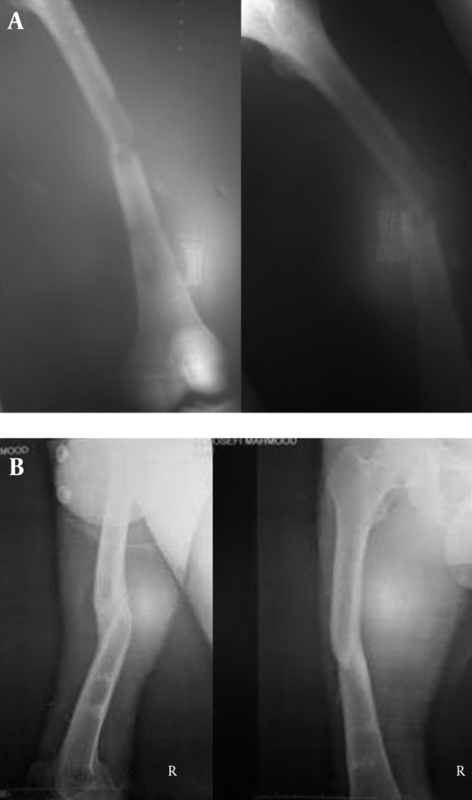 Case Presentation: We report a case of PG following the external fixation of femoral and tibial fractures in a patient who underwent eight months of unsuccessful antibiotic therapy, as well as repeated wound irrigation and debridement. Conclusions: When a histopathological study was at last performed, the diagnosis of PG was confirmed and the patient was successfully treated using corticosteroids. Brocq et al. first described pyoderma gangrenosum (PG) in 1916 as a rare skin disease characterized by extensive ulcerative necrosis (1). Although the etiology of the disease remains unknown, it has been suggested that disorders of the immune system and the infiltration of neutrophils are the probable causes of PG (2-8). PG can present following any trauma, including operative trauma. It is possible for PG to be misdiagnosed as a postoperative complication, for example, extensive operative wound infection, which commonly results in improper treatment. There have been some reports concerning PG following medical diseases and non-orthopedic surgeries (9, 10). However, to the best of our knowledge, reports regarding PG in orthopedic patients are rare (4, 6, 11-14). Therefore, we report a case of PG following the external fixation of femoral and tibial fractures in a multiple trauma patient. A 25-year-old man who suffered from open left femoral (right side) and tibial (left side) fractures following a car accident was admitted to our hospital. Prior to admission, cardiopulmonary arrest occurred and the patient was revived by cardiopulmonary resuscitation. After admission, we found that the distal pulses of the lower limb were absent. Thus, angiography and left femoral artery exploration were performed. Both fractures were reduced and fixed using external fixation. The tibial fracture was treated with hybrid external fixation. Seven units of blood were transfused, and the patient was admitted to the intensive care unit. At the fourth postoperative week, the patient gradually developed painful skin wounds with secretion. The margins of the wounds had bluish discoloration in some areas. The diagnosis of infection was made based on the history of open fracture and external fixation. Antibiotic therapy was started, and the wounds were irrigated and dressed three times a day. This trend continued for eight months, with the wound gradually spreading until it involved most of the left lower extremity (Figure 1). Moreover, serologic, microbiologic, and hematologic studies revealed no abnormal findings. During this period, the wound was debrided twelve times. A wound culture was performed three times, revealing negative findings each time. The patient was referred to the department of dermatology for a consultation. They recommended a deep wound biopsy, and the report was neutrophilic infiltration and inflammatory changes that had no pathognomonic findings (Figure 2). Finally, given the patient's history and the course of the disease, as well as the negative results of the microbiological culture, serological, and histopathological observations, a diagnosis of PG was made. The external fixators were removed and antibiotic therapy was stopped. No intervention was performed following the removal of the external fixators because the fracture site had partially healed within the first eight postoperative months. Treatment with corticosteroids was started. After ten days, the patient had responded adequately to treatment, and the wounds gradually healed over a two-month period. 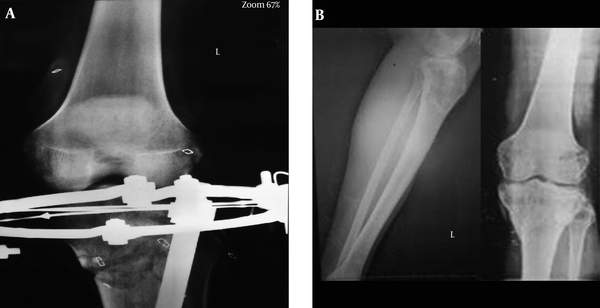 The femoral fracture was united with recurvatum and varus malalignment (Figure 3A and B), while the tibial alignment was acceptable after the union of the fracture (Figure 4A and B). Currently, after nearly two years, the patient’s skin status is normal, without any wound problems. 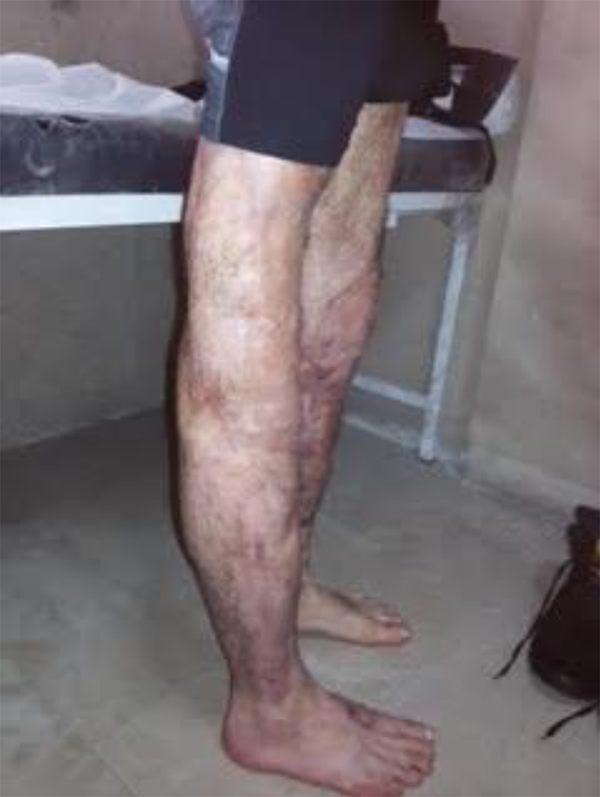 Scar tissue covered the lower limbs (Figure 5). However, the range of right knee motion was restricted, and the patient suffered from genu recurvatum and varus instability during weight bearing (Figure 6). Pyoderma gangrenosum is a rare inflammatory dermatosis, which is characterized by necrotizing, painful wounds. These wounds expand rapidly and usually involve the thighs, legs, and arms. The main problem associated with PG is misdiagnosis, which results in morbidity, as well as an extreme financial burden on both the family and the healthcare system (15). In our patient, as with other reported cases, the delayed diagnosis resulted in an increased hospital stay in addition to the use of a wide spectrum of improper antibiotic therapy. Many PG patients undergo several surgical debridements, which can result in extensive skin and soft tissue defects. In some undiagnosed cases, surgeons may perform amputation or arthrodesis of the involved joints (4). The diagnosis of PG is challenging, and it requires a classic clinical presentation in addition to a biopsy to rule out other important and similar disorders (8). The differential diagnoses include primary infections (bacterial, fungal, and viral), bacterial cellulitis, atypical mycobacterial infections, deep fungal mycosis including blastomycosis, sporotrichosis, cryptococcosis, vasculitis, malignancy, vascular obstructive disease, exogenous or drug-induced tissue injury, and other inflammatory disorders (2, 10). In some cases, PG is idiopathic and occurs spontaneously, while in others it may occur secondary to a disease, trauma, or surgery (2, 4, 6, 7, 9, 10). Previous studies have shown that in 50% - 70% of cases PG is associated with a systematic and chronic disease such as inflammatory bowel disease, rheumatoid arthritis, hematological disorders including acute myeloblastic leukemia, hairy cell leukemia, myelodysplastic syndrome, myelofibrosis, and IgA monoclonal gammopathy, ulcerative colitis, Crohn’s disease, diverticulitis, hepatitis, polycythemia, and malignancy (2, 4, 6, 8-10, 16, 17). However, in 20% - 30% of patients, there is no known cause for PG (6, 17). Both the type and the severity of the underlying disease affect the prognosis of PG, and in many patients it is likely that treatment of the underlying disease will be associated with an improvement in PG (9). In general, the published reports regarding the epidemiology, incidence, mortality, and comorbidities of PG are based on studying patients with inflammatory bowel disease (IBD), which makes it impossible to estimate the incidence of PG in the general population (8). Based on these studies, the incidence of PG was estimated to be 3 - 10 per 1 million people per year (18). In a study by Tromm et al. (19), the incidence of PG was determined to be 0.6% (18, 20). Additionally, the mortality rate was estimated to be approximately 30%. Although the pathogenesis of PG is not well known, it has been suggested that it is an autoimmune disease similar to IBD, as well as a result of the skin infiltration of neutrophils (2-9, 16). Some cytokines such as granulocyte colony-stimulating factor, some interferons, and antipsychotic drugs are known to induce PG (20, 21). Additionally, IL-8, a potent chemotactic agent for leukocytes, and IL-6, a potent chemotactic agent for neutrophils, are involved in the induction of PG (22-24). Recently, Marzano et al. (25) demonstrated that the overproduction of TNF-α, a regulator of other inflammatory cytokines, is an important event in neutrophilic dermatoses. Del Giacco et al. (17) showed that TNF-α and IL-6 are involved in the pathogenesis of PG and the increase in idiopathic cases. Moreover, they demonstrated that monitoring the serum levels of TNF-α and IL-6 is an appropriate tool for assessing the course of the disease and the likely response to treatment. Since the etiology of PG is not yet clearly understood, there is no specific diagnostic test for the disease. The bacterial culture is negative and the wounds are sterile. There is no pathognomonic histopathological finding for PG and only an acute non-specific inflammatory reaction such as necrotizing granulomatous inflammatory changes or leukocytoclastic vasculitis is observed. Dermal neutrophilic abscesses are early histopathological features. Often, neutrophilic leukocytosis and an elevated erythrocyte sedimentation rate (ESR) are seen. Further, hematological studies reveal increased levels of inflammatory markers. Later biopsies show the presence of epidermal necrosis, superficial dermal edema, and complex dermal infiltration (2, 4, 6, 10). Laboratory studies such as biopsy from the edges of skin lesions, counting blood cells and bone marrow aspiration if required, ESR, C-reactive protein (CRP), assessment of renal and hepatic function, electrophoresis of urine, serum proteins, and immunoelectrophoresis, anti-cardiolipin antibody, VDRL, p-ANCA, cryoglobulins, coagulopathy tests, chest radiography, and colonoscopy are required to identify associated diseases or rule out the other potential causes of the ulcers (2, 20). Clinically, PG is often associated with pain, erythema, edema, skin rashes, and pus around the wound. Gradually, a similar injury to hematoma and then a sterile abscess forms, which eventually becomes more widespread. Finally, the large necrotic wound edges will be blue or grainy. These sores can be painful, and it is possible that systemic symptoms might appear. Pathergy, the emergence and proliferation of skin damage at sites of minor trauma or surgery, for example, the placement of an intravenous cannula, which is a feature of PG is seen in 25-50% of patients (2, 6, 9, 10, 16). These characteristics cause PG to be commonly misdiagnosed as infection, and patients are usually treated with potent antibiotics and surgical debridement, which can sometimes be associated with the worsening of tissue damage (2, 4). In cases with expanding painful dermal lesions that do not respond to antibiotic therapy, especially in the presence of a systemic disease, PG is suspected. The goal of PG treatment is preventing the wounds from expanding, stimulating epithelization, and pain relief (26). Nowadays, there is no standard treatment strategy for PG (9), and our current knowledge is insufficient to define an effective treatment protocol (21). Based on the potential role of inflammatory and immune processes in the pathogenesis of the disease, several methods have been introduced for the treatment of PG that are effective in controlling the inflammatory response (10, 16, 17). The treatment principles include immunosuppression using oral or systemic corticosteroids, care of the injured skin, and searching for a potential underlying systemic disease. The combined or sequential use of topical or systemic anti-inflammatory agents is highly experimental, and it depends on the physician’s preference (2, 6, 9, 17, 20). However, some researchers believe that topical treatment, especially in patients with hematological malignancies, is insufficient and only appropriate for conservative and supportive treatment (10, 26). In cases that require the substitution of corticosteroids, the use of cyclosporin A is appropriate (2, 9). Surgery is contraindicated in PG as it can induce the disease process. Therefore, only local debridement is recommended (27). Some researchers have stated that debridement or necrosectomy should not be performed in patients with postsurgical PG (28). To the best of our knowledge, although there have been several reports regarding PG, reports concerning patients with orthopedic problems are rare. Bagouri et al. (4) stated that there are only six reports of PG in patients with orthopedic problems in addition to their patient, who suffered from PG following arthroscopic anterior cruciate ligament reconstruction and who underwent extensive debridement. Armstrong et al. (6) reported another case of PG following total hip arthroplasty. Additionally, Steenbrugge et al., Madsen et al., and Wanich et al. reported a case of PG following knee trauma and tibial plateau fracture, knee arthroscopy, and the repair of the patellar tendon, respectively (5, 11, 12, 29). Furthermore, Verma et al. and Nakajima et al. (11, 30) reported two different patients with PG following total knee arthroplasty. Most importantly, as in the case of our patient, there was no specific finding indicative of PG in all these patients and hence they all received prolonged antibiotic therapy. Our patient underwent potent antibiotic therapy for about eight months while the serological and microbiological findings were negative. However, due to skin lesions that initiated after an open fracture and external fixation, the treatment team misdiagnosed the lesions as infection. Finally, based on the negative laboratory studies, lack of response to antibiotic therapy, and histopathological findings, a diagnosis of PG was made. Unfortunately, because of the misdiagnosis, the patient underwent irrigation and debridement on several occasions, which caused the lesions to worsen. When the diagnosis of PG was made, oral and intravenous corticosteroids were used, leading to the early healing of the dermal lesions. In conclusion, in cases with a clinical presentation of infection, negative laboratory and histopathological findings, and a lack of response to antibiotic therapy, it is necessary to consider PG as a potential cause of skin lesions in order to prevent the patient from sustaining unnecessary pain and discomfort. Authors’ Contribution: Drafting of the manuscript: Adel Ebrahimpour, Amin Karimi, Tooraj Shafaghi, Reza Zandi, Amir Sabbaghzadeh Irani, and Farshad Safdari; critical revision of the manuscript: Adel Ebrahimpour, Amin Karimi, Tooraj Shafaghi, Reza Zandi, Amir Sabbaghzadeh Irani, and Farshad Safdari; administrative, technical, and material support: Adel Ebrahimpour, Amin Karimi, Tooraj Shafaghi, Reza Zandi, Amir Sabbaghzadeh Irani, and Farshad Safdari.